In September of 2009 Tim and I sat down in our living room and discussed how I could reach more people through yoga.. Did I want to teach more classes? I was already out every night of the week until 10 p.m. and the thought of being away from my husband and my daughter who was then seven years old and in grade two even more did not appeal in the slightest. I was already exhausted from getting in each night at 10 p.m. and getting up in the morning at 6 am to start my day, see thai massage clients all day and teach in the evenings. At that time I believe I was already teaching in the range of 10 classes a week and although that is not in the highest end for a lot of teachers, it was a lot for me. There was another problem that we wished to solve, I planned all these fantastic themed classes and if somebody was sick and missed a class, it was gone, they missed it. There was often a lot of complaints about that. People would ask me how they could make up classes. So the solution that we came up with on that afternoon was to duplicate me, my efforts and my time by filming the class that I was already teaching each week. The idea was that I wouldn’t have to do anything I wasn’t already doing, we could film during a time that I wasn’t teaching, people who weren’t able to make it to my classes would be able to make up their classes. Additionally, the waiting lists of people who wanted take classes with me at times that I couldn’t or wasn’t willing to teach (i.e. our family time, weekends) would be able to take classes with me now. I don’t think we quite realized our ability to reach a global audience at this time! From the beginning we decided to “keep it real.” We did not want Namaste Yoga to be polished. This was both for Tim and myself. I did not want Tim to be spending hours in post-production. Also I did not want people to think they had to be perfect. So in leaving in our mistakes and not presenting myself as a perfect yogi, real yoga for real people was born. Through 2009 and 2010 I trained and became certified as a Phoenix Rising Yoga Therapist and group facilitator. This has informed me personally and my teaching deeply. The term, phoenix rising, comes from the mythical story of rebirth and resurrection. According to the parable the Phoenix is a one of a kind bird dressed in a plumage of yellows, oranges, red and gold, corresponding to the colours of a fire. The bird itself lives a 500-1000 year life cycle. At the end of its life the phoenix builds nest of aromatic branches and spices, uses the sun to ignite the fire and his own wings to fan the fire. The mythical phoenix marks its death; plunges itself into the fire, is consumed by the flames and burns into a pile of ashes. Out of the ashes a new phoenix is born with renewed youth to live through another life-span. The story is one of death and rebirth. The theme of death and rebirth, of transformation has been an important one in my life and in the evolution of Namaste Yoga. Namaste Yoga is constantly growing and evolving and we are open that that transformation and change. In November of 2011 we launched our membership site. So I was teaching, seeing thai massage clients, phoenix rising yoga therapy clients, filming, running a membership site and somehow being a wife and mom. I worked incredibly hard burning the candle at both ends when the deck of cards collapsed in January of 2012. I got a headache that wouldn’t go away and that turned into a migraine that wouldn’t go away. First I canceled my personal clients; my thai massage and phoenix rising yoga therapy clients. I continued to teach my yoga classes until the end of February when I decided to take a month off to focus on my healing. During that month I realized that something had to change. I just couldn’t keep juggling all the balls in the air anymore. A month turned into retiring from local teaching and private clients and dropping way back on filming to focus on my own healing. It was an incredibly humbling time. Lots of tears, anger and frustration. 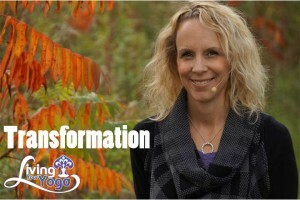 Ultimately that time lead to the biggest transformation in my life and to truly embodying the life of a yogi. I can honestly say I am grateful for my migraines now because they forced me to become a yogi. I think the biggest and transformation through my migraines and with the tools of yoga has been tapas, the self-discipline to focus on my health. I now practice purity/saucha. I am clean. I have been sober for almost two years. I have been without sugar for almost as long. Through these things, and eating more clean than I have in my entire life, many Namaste Yogis have witnessed and commented on the transformation in my physical appearance. I am now experiencing a santosha/contentment like never before in my life. It is my honour, privilege and joy to be able to offer the teachings of yoga with my beloved Tim. I look forward to many more years of svadhyaya/self study, growth and transformation and I surrender/ ishvara pranidhana all that Namaste Yoga has become and will evolve into, to the Divine.